Attack on Titan Gets Spinoff Anime in October.... Chibi Style! Attack on Titan Gets Spinoff Anime in October…. Chibi Style! Production I.G. launched a website Friday which announced that Saki Nakagawa’s Attack on Titan: Junior High spin-off manga will be receiving a brand new anime starting in October 2015. 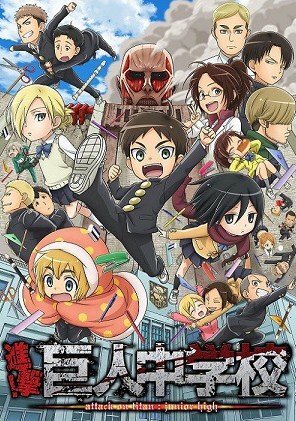 The spinoff is based off of Hajime Isayama’s original Attack on Titan series and depicts the characters as Chibis in a school setting. The cast that voiced the characters in the first season of Attack on Titan will be returning to reprise their roles in the spinoff anime! Yoshihide Ibata (Ashiaraiyashiki no Jūnin-tachi , episode director for Kill la Kill, Haikyu!!) is directing the series at Production I.G. Midori Gotou (Hozuki’s Coolheadedness, Genshiken: Second Generation) is handling the series composition, Yuuko Yahiro (Diabolik Lovers, B Gata H Kei – Yamada’s First Time) is the character designer, and Asami Tachibana (Haikyu! !, Seraph of the End: Vampire Reign, Robotics;Notes) is composing the music. Nakagawa launched the Attack on Titan: Junior High comedy manga in Kodansha’s Bessatsu Shōnen Magazine in April 2012. The manga re-imagines Eren, Mikasa, Armin, and other cast members from the original manga as students and teachers at Titan Junior High School. Kodansha will release the eighth compiled volume in Japan on August 7. Kodansha Comics is releasing the manga in English, and it will published the third compiled volume in April.